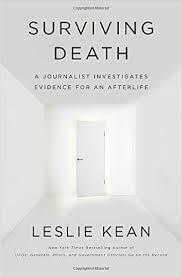 Journalist Leslie Kean wanted to investigate the evidence for an afterlife. In her book Surviving Death, she looks at phenomena such as "life before birth" (children recounting details of previous lives), out of body experiences by people who died and came back, medium activities and "full-form materializations." Her conclusion is that there is plenty of evidence for consciousness surviving outside the body, and that humans have yet to fully understand all of the implications of this fact. Several chapters in the book are written by people who were actively involved in the individual cases being discussed. The book looks at several cases of young children who spontaneously began to recount details from previous lives. Far from claiming to be Cleopatra or Napoleon, the lives being recalled were of "average Joes." One child had vivid and terrifying nightmares about being unable to escape from a plane crash. Another one recalled working on films in Hollywood. The parents of the children documented their statements and were eventually able to track down the people their children had been in previous lives. It is uncanny to hear that the children could recall details that they would have had no way of knowing. In the cases that Kean documents, once the children are able to visit the places they knew in previous lives, they become calmer and eventually the distressing or overwhelming memories of their past selves fade. Interestingly, these children also report "intermission memories" which occur after one life ends but before the next one begins. Another section of the book details OBE (Out of Body Experiences), where the consciousness of a person leaves the body during cardiac arrest. These people describe floating above their bodies and being able to relate things that happened while they were unconscious. An interesting aspect to OBEs is that some blind people have reported being able to see during them. These situations are different from NDEs (Near Death Experiences) where people in cardiac arrest travel to different dimensions beyond the physical world. Cases involving these types of experiences have been reported from around the world, and from people of various cultures and religions. The striking thing about both OBE and NDE situations are that they are remarkably similar when people who have experienced them relate what happened. Scientists who have studied the phenomena don't know if this is attributable to a physiological reaction of the body/brain, or if it is an actual experience that occurs when the consciousness is freed from physical limitations. Similarly, some people experience ELEs (End of Life Experiences) where, on their deathbeds, they are visited by deceased relatives or friends who reassure them about the process of dying. These experiences are positive, with the people often reported to be "joyous" after they occur. Occasionally even bystanders or relatives see the apparitions, or see light or a form surrounding or leaving the dying person. The author also works with mediums who claim to be able to converse with those who have died. She found that some mediums were able to reveal remarkably accurate information. While many people claim to have the ability to communicate with the dead, two mediums who were able to reveal accurate information were able to describe to the author how they receive messages from "the other side." The author mentions that when asked if she believes in life after death, she responds, "The question must be moved from the field of belief into the field of data." Her research into the inexplicable events that have been recounted by those who are dying, have "come back" from death or describe previous lives, shows that we have much yet to learn about what happens to us after death.